Work: A daggered and horizontally billowing shape, emulating smoke spins over a tiny bejeweled green home while video (footage of cowboys working their horses post-rodeo) is projected onto its surface. Blending art with design, paper and a little imagination, artist Judith Hoffman builds her own ‘castles in the air.’ Think children’s paper and cardboard cities, all grown up. “Environment is the central factor in my work. My surroundings and the complexities of location are heavy influences in what I build,” she says. The artist is referring to her large-scale paper constructions, which are replicas of modern structures. 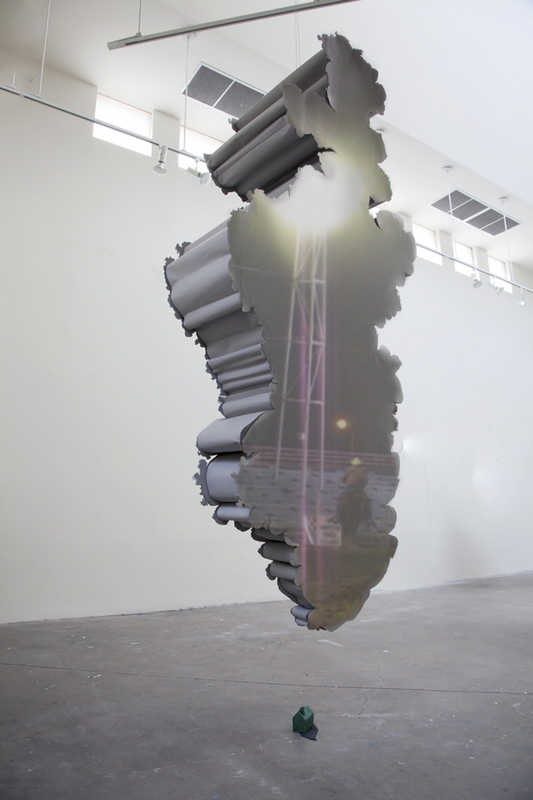 She then uses video to capture the decomposition of these paper installations. It’s a multi-faceted tale of the modern metropolis that perfectly captures the ever-changing face of our contemporary world. So it’s even more fitting that the New York artist recently worked on one of her gigantic paper projects as part of an art-residency program at TechTown’s Quark Gallery in Detroit. “I absolutely love Detroit and it is easily one of my favorite places I have ever been,” she gushed to MutualArt in a recent interview. “It is a city humming with energy and filled with a complexity of beauty that only decay can highlight.” Indeed, Hoffman’s work artfully personifies the rise and fall of a city in one of the country’s most complex urban landscapes. Her project is a four-stage process, where she painstakingly reconstructs buildings out of paper, measuring every crevice, length and leveling contained by the architecture. These paper “slipcovers” of sorts are later used as the backdrop for a slideshow, from images taken by local digital artists. The final stage of this paper-turned-performance piece is Hoffman’s time-lapse video of the work as it disintegrates, which recreates an artistic replica of urban decay. “[Detroit] appears ravaged by economic flight and is in the slow but steady process of rebuilding itself,” she reiterates. (Two views of the Detroit work; Above: “In Hoping We Find Ourselves”: Amsterdam meets Cass; at Right: in collaboration with Ani Garabedian). Her work takes on a slightly different tone than many other artists who have sought to capture the city: “It seems like many artists working in Detroit either focus their eye on how that history has visually manifested itself or create works to trigger new hopes and experiences.” Hoffman’s work does double-duty, incorporating both of these ideas. She says initially, this caused her some trepidation. “As an outsider, I felt incredibly nervous about entering into that discussion but as an individual, growth and decay, especially in man-made structures, are at the heart of my explorations.” Which is why the artist’s larger-than-life reconstructions (and deconstructions) are so aptly-fitting in this context. Hoffman has ‘built’ with other media as well, such as fabric, but gives preferential treatment to paper, as she says, “it’s environmentally responsible given the scale of my sculptures. It’s complicated to work with and accessible, which I like. It’s well-suited to ephemeral installations and lightweight.” (Left: Art in Odd Places: Four Doors, 2011). Still, working with the media comes with its own set of challenges. Despite her five-week deadline and the overall enormity of the piece, the biggest obstacle regarding this installation was unpredictable weather. “I foolishly budgeted a day [for installation] because I wanted the piece to be fresh for the opening and was nervous about rain and wind destroying it before anyone had seen it.” Yet despite her well-laid plans, Hoffman and her assistants battled mother nature anyway. “At five in the morning that day, I showed up to finish the last small pieces and at eight we began with the roof, which was finished and in place by nine, and had flown off by ten. The rest of the day was a epic battle between us and the wind. We won,”she adds, laughing. The artist continues to make varied installations that challenge or are in direct response to the environments surrounding her. In terms of the Detroit project, she says, her aim was to “bring beauty and joy to a place in the city where it was never expected.” In addition to upcoming collaborative work with artist Loren Erdrich in Brooklyn, she plans to return to her residency at Sculpture Space in New York, to create a large-scale installation piece. Hoffman’s ultimate artistic goal is to make work that uses “natural materials to inject softness into areas of human harshness.” She hopes her art will “create experiences that inspire response.” As a trendsetting artist in 2012, it seems her dreams are fast becoming a reality…mission accomplished! (Left: Dysmorphia, 2011) All works by Judith Hoffman; images courtesy of the artist. My work explores our elemental need for a secure sense of home, whether permanent or ephemeral, embodied in the spaces, communities and structures within which we live. It also investigates a countervailing impulse to abandon and escape those same places. This interaction surfaces not only the impermanence of places we rely on as durable repositories for our identities, hopes and dreams; it also considers the material construction of objects disclosing the normally concealed conditions of production. I seek to understand the materially fleeting but ideologically persistent “American Dream”. Judith Hoffman lives in New York City. She attended the School of the Art Institute of Chicago and holds an MFA from Pratt Institute. Her work has been exhibited at national locations including Art in Odd Places, NY (2011), The Soap Factory, MN (2011), Center for Contemporary Art, NM (2011), Kesting Ray, NY (2010), Art in General, NY (2010), ArtBasel Miami, FL (2009), and Deitch Projects (2006). She has been a resident at the Santa Fe Art Institute, Wayne State University and Vermont Studio Center. Hoffman was nominated for the 2012 Joan Mitchell Foundation Grant. Architecture and decay are a consistent focus in my work and I began my fellowship by driving around to look at the neighborhoods of Utica. I became fascinated by the shell of a building at the intersection of Albany and Bleeker Street, its’ bombed out interior embodying the city’s trauma. I cast sugar bricks to build a replica of it, planning to expose the sculpture to the elements and document its decay. Simultaneously in the studio, I was experimenting with less-than-literal representations of smoke and mirrors. For example, positioning mundane objects to appear conjoined or using mirrored paper to create a form in space and reflected light on the wall. I don’t know how I began researching Sears Kit Houses, but as soon as I did, I realized two things. First, that the pre-fabricated, affordable, and stylish mail-order House sold by Sears in the early 1900’s were the first prescription for the American Dream. And second, both knock-offs and originals, of several different versions of these homes dominate Utica today. Sears framed the houses with early growth Cedar, a durable and long-lasting wood. The homes arrived in shipping containers, complete with a 75-page instruction manual, every nail and marked line necessary. It was a natural transition to conjoin two Sears Kit homes at their spire, one upside-down, replicating in exact detail the 1912 Maytown, at 1/12th its scale. The sculpture, in its finished state, will appear to be constructed entirely of black paper. However, as I built the stick-frame armature for the base house, I found myself interested in its unassembled disorder. Each section is built separately and in its dispersal, contains both the excitement of a form before completion and the devastation of a hurricane, not unlike the building at Albany and Bleeker.